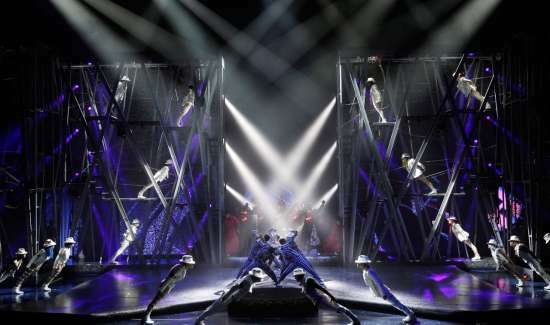 Michael Jackson ONE is a mix of acrobatics, dance and visuals that takes the audience on a journey through the music and spirit of Michael Jackson. 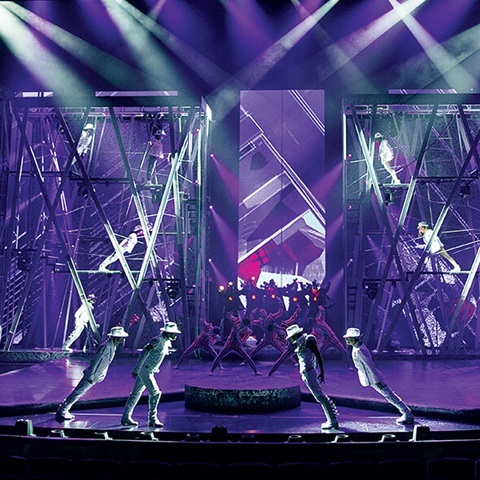 In Michael Jackson ONE, Michael's spirit is channeled through the vibrant energy of the cast of dancers and performers, accentuated by aerial performance, driving acrobatics, and vivid choreographies. Michael Jackson: Michael’s spirit is guiding the performers and the audience on the journey, culminating with the release from the grip of Mephisto, which leads everyone to reconnect with Michael’s spirit and his child-like heart. Mephisto: a malevolent machine made of radios, microphones, tungsten bulbs, televisions, cameras, and surveillance equipment, makes his first appearance along with the Tabloid Junkies, his dance corps and guards. Smarty Pants: One of Michael’s qualities, gracefulness, is learned by Smarty Pants as she joins in a towering hat juggling act as images of giant hats float and bob everywhere on the screen and on the stage. The Smooth Criminals: Mephisto sends in his elite force, the Smooth Criminals (rhythmic gymnasts), to do battle with the MJ Warriors, Michael’s dance corps. Time goes crazy as the metaphoric threshold is crossed into a magical world inspired by Michael’s imagination. High above the audience, rotating bungees churn to the funk infused, drum and guitar-driven rhythms of Beat It. Evil forces in the underbelly of Mephisto’s world, the Thrillers (dance corps) and the Ghouls (trampoline artists and rhythmic gymnasts) celebrate Mephisto’s victory. Michael Jackson’s visual iconography is firmly entrenched in the minds of his fans. In fact, some of these visual icons – Michael’s white glove, penny loafers, fedora hat and shades – are at the very core of the storyline, and are charged with symbolism and have the force of talismans. The minimum age to attend the show is 5 years old. Guests under the age of 18 must be accompanied by an adult. This 90-minute show (not including intermission) goes live 5 days a week at 7:00 PM and 9:30 PM, Friday, Saturday, Sunday, Monday, and Tuesday, and is dark on Wednesdays and Thursdays. It is not permitted to take pictures or record video of Michael Jackson ONE. Ticket prices start at about $89 for standard seating and prices go up from there. No V.I.P. experience is available. Ticket Starting Price (Full Price) – Approximately $89 for standard seating. * The capes of the “Tabloid Junkies” characters are lined with tabloid headlines about Michael Jackson in several languages. * The artists’ costumes in the “I Can’t Stop Loving You” and “Billie Jean” scenes are equipped with hundreds of LED lights. 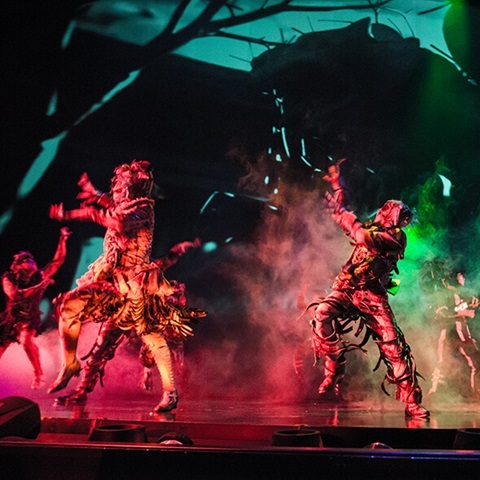 The costumes are designed in such a way that the performers disappear completely and the only thing the audience sees is the movement and changing colors of the LED lights. * In the “Smooth Criminal” scene, the drawings all over the artists’ backs and faces represent dragon tattoos inspired by the real, full-body tattoos traditionally worn by the yakuza, members of Japanese organized crime.